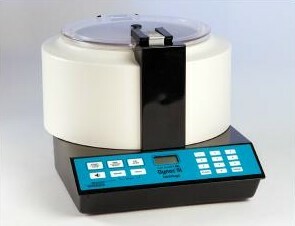 The DYNAC® III centrifuge is the ideal choice for high performance separations in hematology, chemistry, urinalysis, blood banking, microbiology and cytology. It is compact and portable enough to fit into most laboratory refrigerators. Interchangeable rotors are available and has a continuously adjustable electronic speed control and electronic tachometer, allowing the selection of a wide range of operating speeds. A zero speed switch, fail-safe positive cover lock and other safety features give the operator maximum protection. 10 programmable memory locations are available for storage of time and speed settings. Constructed with a one-piece, heavy gauge aluminum guard bowl and rubber feet bolted to the bottom of the base plate to absorb vibrations. Does anyone know how to increase voltage to motor to increase RPM speed? Anybody have the service manual? I Need it! There are no threads in BD Biosciences DYNAC III Reviews at this time.